A friend recently asked people to help select the quintessential LA movie for a list she’s compiling and it inspired me to create my own list of favorite LA movies. It also made me realize that there could never be just one film to fully sum up the experience of my hometown. Here are my top 15 movies, in chronological order, that each have their own way of showcasing the many sides (and neighborhoods) of LA in all its imperfect, beautiful, contradictory, glamorous, gritty, heartbreaking, hilarious, limitless glory. Sunset Blvd (1950) – If you want to be transported to Hollywood’s golden age in all its glitz and grit then you simply must see Sunset Boulevard. From the opening scene of the dead narrator floating face down in the pool to the final moment when a completely deluded Gloria Swanson is ready for her closeup, this noir classic is 100% black-and-white gold. Obsessed!!! Boulevard Nights (1979) – This is the classic Chicano-in-East LA movie. It’s also one of the first movies I ever saw that reflected some of my own everyday realities growing up in southeast LA … nanas, cholos, lowriders … hijole! A must in the cinematic anthology of every Mexican-American household. Fast Times @ Ridgemont High (1982) – I was too young to watch this R-rated movie when it first came out, but Fast Times is the ultimate 80s adolescent flick that never gets old no matter when you grew up. It’s laidback LA with beaches, malls and horny kids galore. 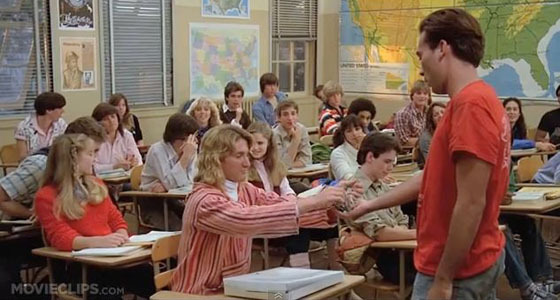 The scene with Sean Penn as stoner surfer dude Jeff Spicoli getting pizza delivered during Mr. Hand’s class is comedic perfection. Boyz N The Hood (1991) – This movie was the first raw portrayal I had seen of life in South Central LA. It’s not pretty, but that’s the point. What Boulevard Nights is to Latinos in Los Angeles, Boyz N The Hood is to black Angelenos. Heat (1995) – Plenty of movies take us through the underbelly of LA from the lens of a cop and robber, but Heat is the only one where said cop is Al Pacino and the (not so?) bad guy is Robert De Niro. It was the first time these two acting giants did their face-to-face on the big screen and I went to the movie theater eight times to see it. Amaze. Clueless (1995) – As if! Probably the two best lines to come out of this movie in which Alicia Silverstone is at her absolute cutest and funniest. Filled with all sorts of LA-isms thanks to writer Amy Heckerling, I can’t help but love the absurdity of the cast’s over-privileged, underachieving yet well-meaning rich kids. LA Confidential (1997) – Even though I’m not in love with this movie as much as every other person I know, it still deserves to be on the list of quintessential LA movies. The fabulous recreation of 1950s LA replete with cool cars, crooked cops, glam fashion and an in-her-prime Kim Basinger makes for an award-winning nod to film noir. Night @ the Roxbury (1998) – This is one of those mindlessly entertaining movies I can watch over and over again. Will Ferrell and Chris Kattan are awesome as head-bobbing brothers who think their ridiculous dance moves, tacky clothes and horrible haircuts warrant them the hottest chicks and entry into the hottest club in LA. It’s a caricature of every douchetastic Ed Hardy type you’ve ever met in Los Angeles. Crash (2004) – The first time I saw this movie I was absolutely wowed. Traversing the LA landscape both literally and figuratively, Crash smashes us into the mirror of our own racial and socioeconomic prejudices regardless of zip code or skin color. Sandra Bullock is far from Miss Congeniality and in her best role ever. Collateral (2004) – This is the one movie I actually like that stars Tom Cruise, and it’s the kind of LA movie only director Michael Mann could do. (Heat, anyone?) It’s an after-dark cab ride that careens through the scary and seedy shadows of Los Angeles with a picture-perfect performance from Jamie Foxx. Spanglish (2004) – This is a well-crafted movie that’s funny and lighthearted yet doesn’t shy away from showing the immigrant struggle, not to mention the insecurities of people who seem to have it all. The experience of Flor the housekeeper reflects the reality of Latino service workers and the sacrifices made for a better life. Quinceanera (2006) – I love this movie, which should get more attention than it does. Taking place in Echo Park, it follows a Latino brother and sister as they face several big issues — teenage pregnancy, homosexuality and gentrification of the neighborhood. The characters are fictional, but the story is very real. 500 Days of Summer (2009) – Pretty much a love letter to Downtown LA, this movie is simply marvelous based on cinematography alone. Never mind Zooey Deschanel’s annoying character. The shots of the Bradbury Building, the park bench next to Angel’s Flight, the endless grandeur of our city’s architecture… DTLA all the way, baby. La La Land (2016) – I don’t care what all the bitter, cynical critics say — watching this movie is exhilarating, inspiring and bittersweet. It’s also very white, but I still love it, partly because it’s so fun trying to identify all the locations across Los Angeles (and Long Beach) that are so lovingly captured. And the music? Pure sing-a-long joy. La La Land truly captures the spirit of making your Hollywood dreams come true, even if it comes at a cost you hadn’t expected. Great list! “To Live and Die in LA” is another favorite. Also “Cheech and Chong’s Next Movie” with great scenes on the Strip and East LA. Great list but I would add Valley Girl and Chinatown!